Some patients with wet age-related macular degeneration can be treated with a type of laser treatment known as photocoagulation. Although it is less common, new blood vessels sometimes have not yet damaged the fovea, the direct center of the macula and the area responsible for central vision, when they first occur. If you are one of these patients, you may benefit from photocoagulation. According to the Macular Photocoagulation Study Group, only 10-15 percent of lesions are small enough and sufficiently defined to be treated by laser photocoagulation. In this procedure, done at all 5 of our offices, a special laser is used to seal abnormal, leaky vessels under the retina. 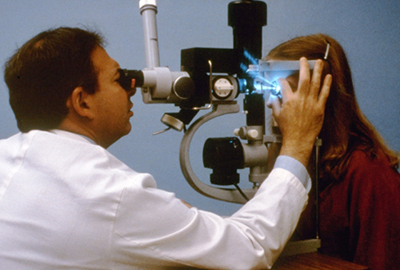 Following the laser treatment, your vision may be blurry but will gradually improve. You will not be able to drive home following the treatment. Therefore, you should make transportation arrangements. While the treatment may be initially successful, the neovascularization returns in up to 50 percent of patients. Therefore, you will require close monitoring after having laser treatment, including testing such as fluorescein angiography, indocyanine green angiography or optical coherence tomography (OCT). 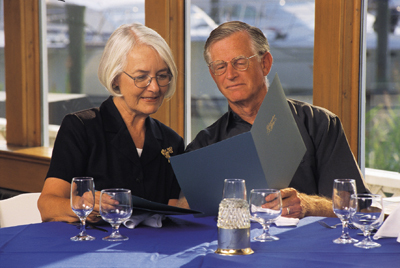 In April 2000, the FDA approved a treatment for wet AMD called photodynamic therapy (PDT). In some instances this treatment is still used when the abnormal, leaky vessels are directly under the fovea. If a traditional, heat generating laser were used, it would damage the fovea and cause more central vision loss. If you have leaky vessels under the fovea, you may benefit from photodynamic therapy. Some patients with Central Serous Retinopathy may also benefit from PDT. Photodynamic therapy (PDT) is done in the office setting. During the treatment, you will receive an intravenous injection of a drug called Visudyne. The drug becomes concentrated in the abnormal vessels under the macula. Your doctor will then focus a cold laser-light on the macula. This cold light triggers a reaction with the drug that effectively closes off the abnormal blood vessels without damaging the macula. Because the healthy vessels remain intact, there is less damage to surrounding tissues and this in turn can help prevent vision loss. Your doctor may also recommend a therapeutic injection of triamcinolone acetonide in conjunction with the PDT treatment. This combination therapy has been shown to make the PDT more effective, often enhancing the effect of the treatment and decreasing the frequency of re-treatment. The American Macular Degeneration Foundation reports that in one large clinical trial, photodynamic therapy with Visudyne delayed or prevented vision loss for over one year in patients with predominantly classic lesions. While effective, it is possible for the abnormal vessels to recur and for you to require additional treatments. Therefore, close monitoring is essential. Because wet macular degeneration is the largest cause of vision loss in people over age 60, it is critical that you have regular, dilated eye exams. Once vision is lost, it cannot be restored. Therefore, early diagnosis of dry age-related macular degeneration and on-going monitoring represents the greatest opportunity to preserve your vision.